If your scupper is OK, why replacement the whole thing? We carry a broad range of scupper flappers to fit many different plastic scuppers, stainless capped resin scuppers, and stainless steel scuppers! 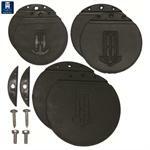 Rectangular rubber flapper for stainless steel oblong scupper.